The North Fork of the Virgin river begins north of Zion at Cascade Falls which comes out of a cave near Navajo Lake (elevation 9,000 ft). The East Fork of the Virgin River originates above Long Valley. 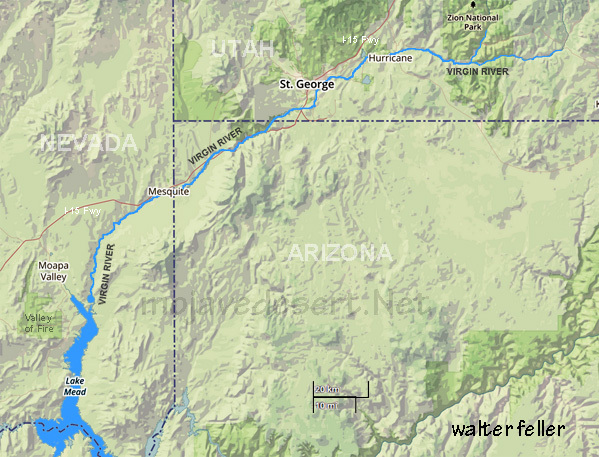 Both the North and East Forks of the Virgin River run through Zion National Park, through the southwestern corner of Utah into the northwestern corner of Arizona, a portion of Nevada and then empties into Lake Mead (approx. 1,000 ft elevation), then into the Colorado River, which empties into the Gulf of California/Sea of Cortez. 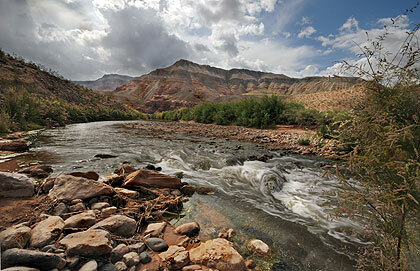 The total length of the Virgin River is about 200 miles. The climate of the river are that of the Mojave Desert ecosystem with hot summers and mild winters. Flora and Fauna along the river are also typical of the Mojave. The naming of the river according to some sources is attributed to Jedediah Smith who named the river after Thomas Virgin, a member of his 1827 party. Virgin was severely wounded by Indians during a battle in this area. Virgin was later killed in a fight on the Umpqua River. Another possibility, but not certainty, is that the Virgin River was named "La Virgen" by Spanish Catholic Missionaries in honor of the Virgin Mary.